I don’t know about you, but 7th grade is a little bit intimidating! It just seems like things start getting more serious around now. High school is on the horizon, and this mama can’t believe that her baby girl is officially in Jr. High! If you’ve been following my daily schedules you’ll notice I’m in denial about my kids getting older! Strawberry Shortcake (who is now almost as tall as I am) is growing into an amazing young lady with talents and interests all her own so it’s a really cool time. She’s an amazing artist, and has a very creative nature which just amazes me. 5:00pm – Sports start! Strawberry Shortcake does swimming on T/Th. You’ll notice that my 6th and 7th grade schedules are very similar. I also only have them doing typing once a week, but they will be typing their writing assignments and it’s also part of their options homework. So I just allotted some time each week for them to catch up on typing minutes or their writing projects as needed. Strawberry Shortcake also participates in our weekly options program and this year she gets to do speech & debate, drama, computers, literacy in film, home economics, and game theory! It should be a fun year for her. If you’d like to see what curriculum she’s using this year, make sure to check out our 2015-2016 curriculum post! what does a 7th grader do for handwriting? she doesn’t have handwriting anymore. I think at 7th grade they’re writing enough papers, and doing enough worksheets that they don’t really need the practice. She does the Spelling You See copy work though and so in my opinion that kind of doubles as handwriting too. When I taught college students who needed to learn to type, I sent them to this site. It will keep records and grade their work, too. Your method of scheduling home school work is great. I wish I had done that with my son, but we winged it. We were very unstructured. You mentioned a typing program in one of your posts. Is it free? How are the lessons? Do your kiddos write in cursive or type schoolwork? That is a huge concern for me. Are we to stress old school cursive or typing as it seems typing is the new norm? I read that some schools were bringing back cursive writing. I was surprised to learn that cursive even left schools. yes, https://www.typing.com and my kiddos start cursive in 3rd grade usually. 2nd -3rd is usually when I feel like their fine motor skills are developed enough for cursive. They normally do most of their work in manuscript unless it’s handwriting and it asks for cursive. I let them write in whatever they want. I think they should for sure learn manuscript as all forms they’ll fill out in live have to be printed. But we also teach cursive and for fun they had pen pals for awhile that they had to write to in cursive to practice. But yes, I would definitely stress typing as well since it’s the new norm, and they’ll for sure need to be able to type when they’re a little older. My 7th grader types all of her writing assignments now. I’d like to know more about your “options program.” Who, what, when, where, how? 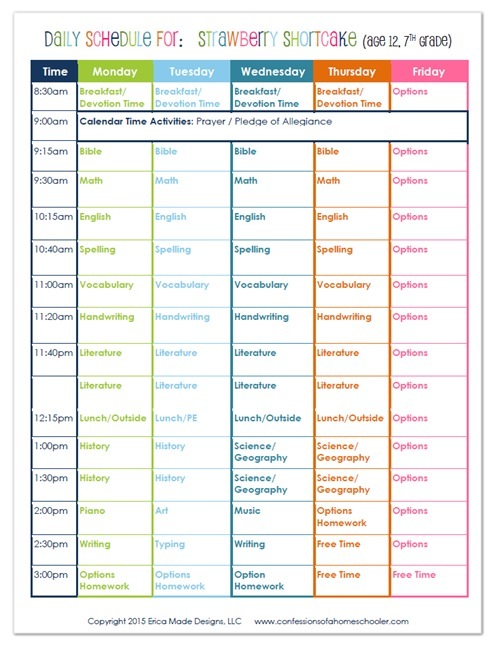 I recently purchased the same vocabulary curriculum for my children and was curious how much time you plan to spend on each unit. Also, are you doing a separate spelling program? Hi Erica – My question is how do you get your kids to get through this much work on a daily basis? My son is almost 12 and has the slowest work pace in the world. I have tried incentives to motivate him but it doesn’t help. His daily schedule is a less than what you have listed and it still takes him 6 to 7 hours to finish. You have “times” associated with your subjects, so what happens when your student isn’t finished in the allotted time? Thanks! I have the same problem, Amy. It is frustrating at times because we do history together with my other children. I have just stopped him where he was in the lesson and moved on to the next one. Whatever he didn’t finish would be homework or work done before going outside or anything like that. Hi! I am a 7th grader too! Your blog seems so intresting! Is there a specific program that you belong to? I go to California Virtual Acadamys right now. Thanks so much! I am going to be homeschooling my son for the first time and he just recently turned twelve and will be in the seventh grade. I came across ur blog while researching the laws I need to abide by and the books/ materials I will need. Any advice is welcomed as I am a new to all this. What is the name of the program you use to type in their daily assignments for them? ?